SIDAF had another successful Awards Gala in June of this year. Together with Past Mayor Bob Brattina, his wife Carol and Councillor Judi Partridge we all enjoyed an excellent dinner at Dundas Golf and Curling Club after which we honored our award winners. 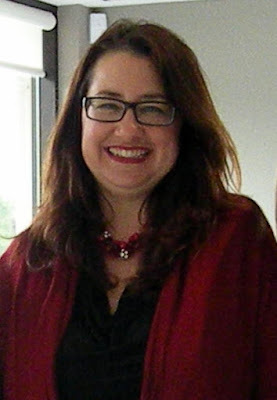 Natasha of Interval House and Flamborough Womens Resource Centre – winner of our Ruby Award. This award honours women who have worked to improve the lives of women and girls through their professional and/or volunteer work. Rahanaz winner of our Live Your Dream Award. This financial award assists women who provide the primary source of financial support to their families by giving them the resources they need to improve their education, skills and employment prospects. 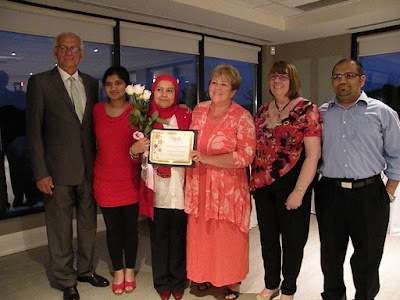 Rahanaz is photographed here with, from the left Bob Brattina previously Mayor of Hamilton, Rahanaz’s daughter, Rahanaz, Carol Brattina, Pauline Hardcastle President SIDAF, Rahanaz’s son. Randi Warner from PartyLite, Choices in Dundas and Pauline’s Fine Art. Posted in Fundraisers, SI-DAF Events.